How much does it cost to travel to Guatemala? How much money will you need in Guatemala? Q274 ($36) is the average daily price for traveling in Guatemala. The average price of food for one day is Q77 ($10). The average price of a hotel for a couple is Q187 ($24). Additional pricing is in the table below. These average travel prices have been collected from other travelers to help you plan your own travel budget. How much money do I need for Guatemala? Guatemala has both history and natural beauty. The Mayan culture is prolific throughout the country, beyond the most famous ruins in Tikal. The national parks and beautiful landscapes are equally as mesmerizing. 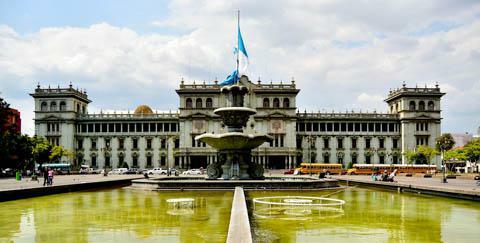 Guatemala is a diverse country with a lot to offer all types of visitors. The country can loosely be divided into five regions. The area around Guatemala City is the Central Highlands. The Western Highlands include Lake Atitlan and many of the modern Mayan villages. The Caribbean Coast has the hottest and most humid climate. There is also boat access to Belize from the Caribbean Coast. The Peten region in the north has the most impressive Mayan ruins. This is also the area with the most jungle environment. Finally, the Pacific Highlands provide the Pacific beaches and hot temperatures. Whether you're visiting Guatemala for its rich history, impressive culture, beautiful environment, or adventure sports, you won't be disappointed. During one trip you can get lost in the history of this country, visit volcanoes, and meet with the vibrant people. Guatemala is truly a unique and culturally rich country. Many people fly directly into the countries largest airport, La Aurora International Airport in Guatemala City. It is also possible to reach the country from its nearby neighbors. There are frequent bus connections from most countries and boat access is available from Belize. Bus travel in Guatemala is truly part of the experience. Referred to as "chicken buses," many of the intercity buses are old school buses that have been colorfully decorated. These are much cheaper than the other tourist oriented bus options and they can offer a fun adventure as well. On occasion the driver may try to raise the fare for foreign travelers. This is generally avoidable if you pay attention to how much others are paying and insist on paying the same fare. The local currency in Guatemala is the Quetzal. There are many places to exchange US dollars, particularly in touristy areas. It can be more difficult to exchange other types of currency so it is recommended that you travel with US dollars. ATMs are available in the larger towns, but if you're going to smaller communities make sure you carry enough cash with you. It can be difficult to find places to exchange travelers checks so this is not a reliable form of currency. If you're shopping for souvenirs in an outdoor market make sure you negotiate. There are some interesting handicrafts made in the country. Some popular options include fabrics and traditional textiles, clothing such as Mayan blouses or skirts, and jade. Other popular souvenirs include coffee, cardamom, and Ron Zacapa Centenario, which is Guatemala's prize winning rum. As with many countries around the world, internet is now widely available throughout the country. Even in the most remote areas you are likely to find an internet connection somewhere. In larger cities, WiFi is available in some restaurants and many hotels also offer it to their guests. Guatemala has a rainy season between the months of May and October. During these times it can be difficult to travel to some of the more remote areas. The hottest months are March and April, and in particular the low lying coastal areas can get uncomfortably hot. In the central and western highlands the temperature is usually mild and can even become cool at night. Volcan Pacaya: This active volcano last erupted in 2010. It is located near Antigua and offers many hiking trails that are opened to the public. It can be a difficult hike, particularly if you plan to climb it, so be sure and come prepared with many supplies and plenty of time. El Mirador: This was a major Mayan City during the 6th century BC and was later abandoned during the 9th century. Much of the ruins remain covered by jungle today. The closest village accessible by car is Carmelita and then it is about a five day hike to the ruins. Chichicastenango Market: Often referred to as "Chichi", this market is a not to be missed shopping destination in Guatemala. It is located about two or three hours southwest of Guatemala City and has everything from local fabrics, masks, wood carvings, pottery and more available. The city also has many different festivals so if possible, try to overlap your visit with one of these events. In touristy areas you can find many different types of cuisines, but in the smaller towns your options will be limited to traditional Guatemalan dishes. Guatemalan cuisine is somewhat different than Mexican food in that it is not as spicy and prepared with somewhat different techniques. Frijoles negros: This Guatemalan dish is similar to a thick soup and is made with black beans. It is generally flavored with salt, ham hocks, onions, garlic, tomatoes, cumin, oregano, chili peppers, vinegar and more. Tamales: Tamales are a popular food throughout the country. The dish is made by filling corn meal with anything from meat and cheese to vegetables. They are wrapped in banana leaves and steamed until cooked through. Churrasco: This is a popular dish throughout the country and is often served at family gatherings or during celebrations or festivals. The meat is grilled and served with chirmol on top. Chirmol is a red sauce that is made with chopped tomatoes and onions. Corn, guacamole, grilled potatoes, stewed black beand and rice or tortillas are often served on the side.